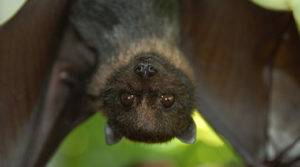 A Mariana Fruit Bat juvenile. Photo by Anne Brooke. Hi everyone! I hope you all had a good week! Since the Japanese cherry blossoms are blooming in Washington, DC, I thought that I would write about a bat from Japan. I found an adorable fruit bat called the Mariana fruit bat. The Mariana fruit bat has dark brown to black fur covering most of its body with grey hairs throughout and a beautiful gold or pail brown neck floof. Mariana fruit bats live in tropical and subtropical climates of Japan, Guam and in the Marina islands. They like to roost in limestone forests, coconut groves, and vegetation. During the day they mostly sleep but they also groom, fly around, and climb around. They usually leave their roost to get dinner around sunset. Since these bats are fruit bats, they like to munch on fruit and occasionally flowers and leaves. Sadly, these bats are endangered. This is due to habitat loss caused by timber removal, natural disasters, and habitat destruction caused by non-native animals. They have also been hunted and killed as a crop pest. If you’d like to read more about these bats, you can read about them here. Previous StoryLove the new place!